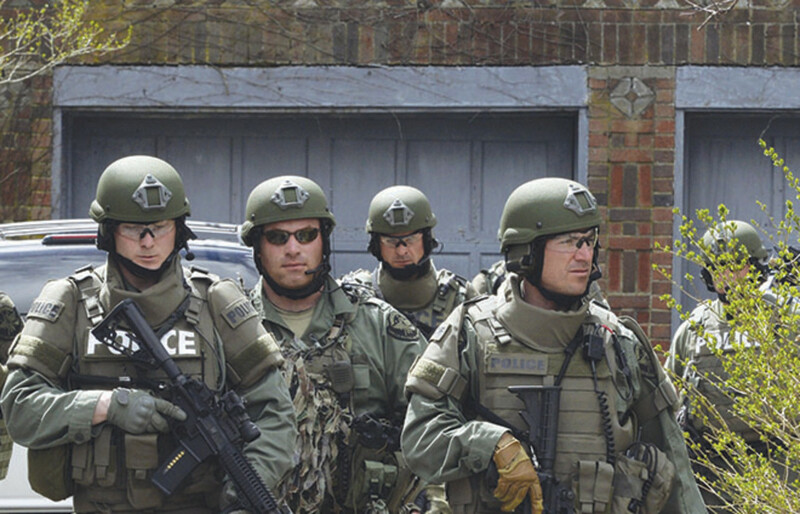 How military-style policing became America's new normal. In 1775, American rebels in the Massachusetts towns of Lexington and Concord took up arms against British troops intent on searching American property for contraband weapons. The Revolutionary War had begun, motivated in part by frustration with military occupation. 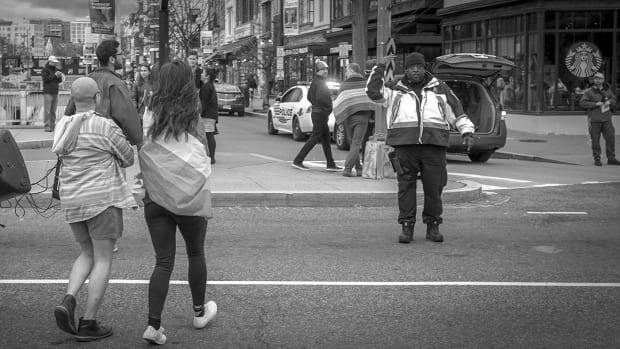 This April, in Boston, just 15 miles southeast of the site of the “shot heard ’round the world,” citizens gathered to cheer police who, thanks to their uniforms and weapons, were all but indistinguishable from soldiers. For half a day, the city had been in “lockdown,” a term that originated in California prisons in the 1970s but has since spread, most notably to schools, where lockdowns became commonplace after the 1999 shooting at Columbine High School. Now, for the first time, we have seen a citywide lockdown requested on American soil—and heard it greeted by applause from the affected population. 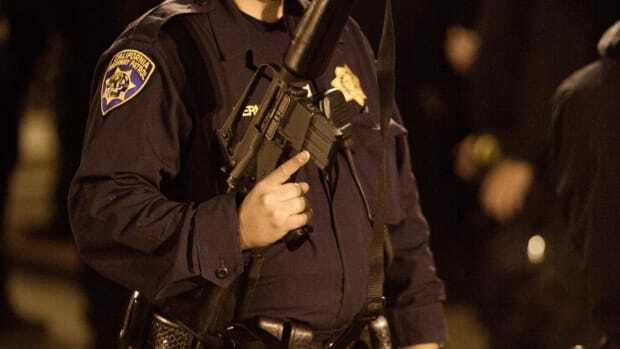 In the fascinating and sometimes terrifying Rise of the Warrior Cop: The Militarization of America’s Police Forces, journalist Radley Balko traces the changes in American policing from colonial times to the present. 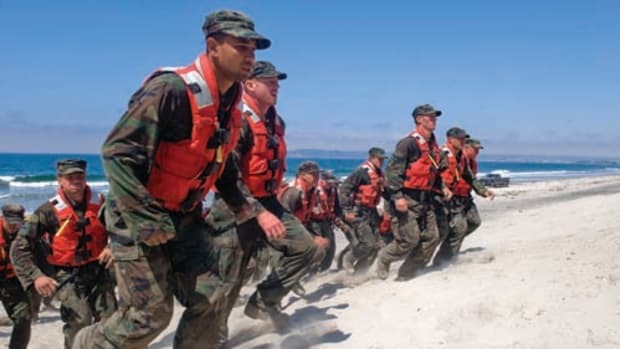 His focus, though, is law enforcement’s increased reliance on military hardware and strategy in the last 45 years, especially in the form of SWAT (special weapons and tactics) teams. POLICE AS WE RECOGNIZE them were invented in 1829, in London. In 1845, New York City established a police department based on the London model; over the next decade, most large U.S. cities followed suit. One could say the militarization of U.S. police began in the 1850s, when individual officers started carrying guns. This was perhaps inevitable, given our long-running national love affair with guns and our predilection to use them. But a baton-twirling cop with a six-shooter is a far cry from a team of helmeted, balaclava-clad SWAT officers wielding battering rams and large-caliber semiautomatic rifles. 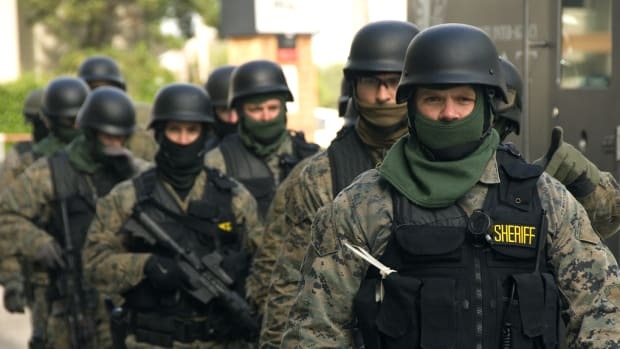 The present-day prevalence of paramilitary policing is inseparable from the host of changes in U.S. law that began when Richard Nixon declared war on drugs. In 1970, with Republicans and Democrats competing to look tough on crime, the budget for the federal Law Enforcement Assistance Administration jumped from $75 million to $500 million. Balko interviews Don Santarelli, former head of the organization, who looks back despondently: “[Police] didn’t value education or training. They valued hardware. ... Anything the police chiefs could dream up to make themselves look more fearsome, they wanted.” And once police had the equipment, they started using it. The first fatality of the drug war took place in 1972, when federal agents conducted a helicopter attack on what was supposed to be a million-dollar PCP lab in Humboldt County, California. According to a reporter who tagged along, the raid resembled “an assault on an enemy prison camp in Vietnam.” An unarmed hippie named Dirk Dickenson was shot in the back and killed, but the agents found little but some baggies of marijuana and two tabs of LSD. When the local district attorney had the shooting officer indicted on murder charges, a specially deputized U.S. attorney moved the case to federal court, where a judge dismissed it. Militarization stalled during the Carter presidency, but surged again in the 1980s. Ronald Reagan signed the Military Cooperation With Law Enforcement Agencies Act, advocated the repeal of the exclusionary rule (which keeps illegally gathered evidence out of the courtroom), and expanded civil forfeiture laws, which allow the state to confiscate money and property related to criminal activity. In addition to shifting the burden of proof to defendants, these new laws created huge incentives for police departments to establish and use SWAT teams—and, perversely, to postpone raids until after drugs had already been sold. Confiscated drugs are simply destroyed, but confiscated money and property can help replenish department coffers. SWAT became a moneymaker. 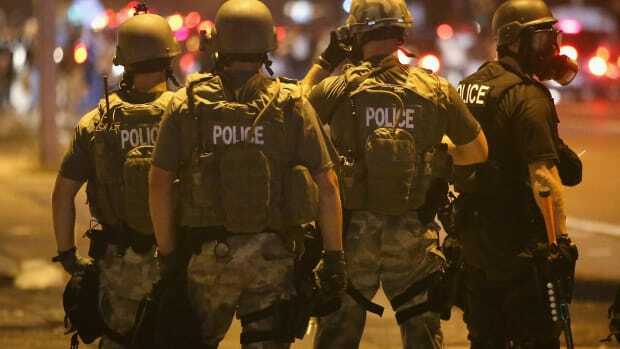 Paramilitary police tactics were designed, Balko writes, “to stop snipers and rioters—people already committing violent crimes.” Today, however, SWAT teams are used mostly “to serve warrants on people suspected of nonviolent crimes.” Paramilitary raids on American homes, which just four decades ago seemed extraordinary, have become common, as has legal forgiveness for any “collateral damage.” The Supreme Court has by and large acquiesced, creating a string of drug-related exceptions to the Fourth Amendment. The lax oversight of SWAT raids, and the speed at which they unfold, make errors almost unavoidable. Information is gathered from unreliable informants; the wrong doors get broken down; the wrong people end up being home. It’s impossible to say what percentage of all SWAT actions are botched, as police departments are disinclined to keep such statistics. But Balko stitches together enough reports to shock the conscience. His descriptions of raids, bungled or otherwise, constitute one of the book’s greatest strengths. It’s one thing to bemoan sloppy policing in the abstract, and quite another to read visceral descriptions of citizens awakened and cuffed at gunpoint, then questioned for hours while their homes are violently turned inside out. In one particularly nightmarish case, a SWAT team raided the house of Cheye Calvo—the mayor of Berwyn Heights, Maryland—on the same day police themselves had delivered a large package of marijuana to his door (he had brought it inside with no knowledge of its contents). During the raid, Calvo’s two Labrador retrievers were shot and killed (whenever a SWAT team kills a dog, Balko notices). The mayor and his mother-in-law were handcuffed and interrogated for hours and left with a broken door, a house turned upside down, and pools of their dead dogs’ blood. In 2010, nine minority-owned barbershops in Florida’s Orange County were raided by SWAT in a “licensure inspection.” “Administrative searches” of this type require neither probable cause nor warrants, and turn regulatory law into a set of loopholes for SWAT deployment. Barbers and customers were cuffed at gunpoint, and 37 arrests were made, but 34 for nothing worse than the misdemeanor of “barbering without a license.” That same year, the big guns were sent to a nightclub near Yale University for an inspection that uncovered—shockingly— a crowded venue full of students drinking. 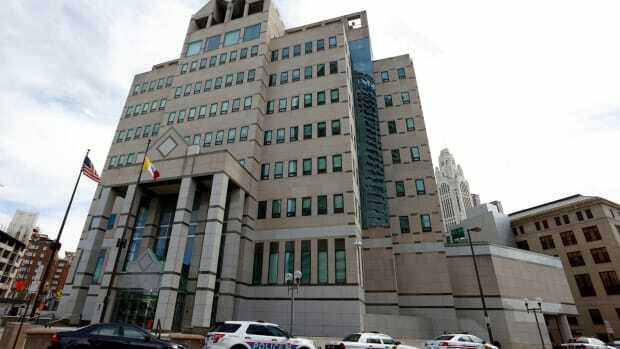 Even if departments kept figures on botched raids, these wouldn’t count. This is just the way it’s done. This selectively originalist analysis is too clever by half. The authors of the Bill of Rights would indeed be surprised—probably alarmed—by the immense power of contemporary police. But they would also be shocked to see black citizens with the right to vote, to say nothing of a black president. Constitutionality is determined by the court decisions we have, not the court decisions we want. Balko seems to know his Third Amendment argument won’t convince anyone, and that new checks on militarization and its excesses are unlikely to emerge in the immediate future: “So long as partisans are only willing to speak out against aggressive, militarized police tactics when they’re used against their own ... it seems unlikely that the country will achieve enough of a political consensus to begin to slow down the trend.” Liberals weren’t outraged by paramilitary violence in the sieges at Ruby Ridge, Idaho, and Waco, Texas; conservatives don’t bridle when SWAT teams round up undocumented immigrants or raid medical-marijuana clinics. The recent shuttering of Boston while police roamed the streets from house to house attracted little mainstream criticism. Balko carefully prefaces his argument by noting that it isn’t, at its core, “anti-cop.” I suspect this is because he hopes to convince as many people as possible. As a former police officer, I have my doubts. Balko asserts that most police officers regularly commit felonious perjury. Lying, he writes, is “routine,” “expected,” and “part of the job.” He supplies little evidence for this claim—an absence that is particularly notable because the rest of his book is so meticulously researched and thoroughly footnoted. “Bad cops are the product of bad policy,” he warns us. But this is too glib. Bad policy creates bad policing. Bad police, however many there may be, are a separate problem. It’s similarly telling that Balko doesn’t mention the frequency with which police kill people. Since 1975, the number of police-involved killings has averaged about 400 per year. If anything, data indicate that overall, police—despite their militarization—are becoming less trigger-happy. Reasonable people can debate whether 400 police-involved homicides a year is an acceptable number—and a SWAT raid doesn’t have to be fatal to be wrong—but it’s hard to resist thinking that Balko leaves out these statistics because they take the edge off his argument. 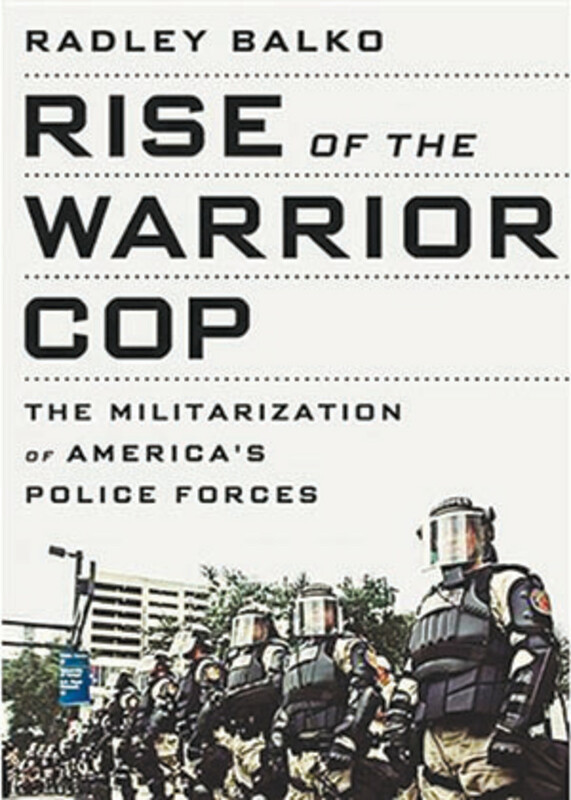 EVEN IF SWAT RAIDS don&apos;t pose an existential threat to American liberty—and Balko makes a strong case that they do—Rise of the Warrior Cop persuasively demonstrates that they’re simply unnecessary. The problem has little to do with the Constitution, and solving it doesn’t require some radical innovation in police practice. Most warrants are served just fine the old-fashioned way: by knocking on someone’s front door. In tactically tricky situations, police can wait for their suspect to walk to the corner store. The relevant question is political: Having given our police broad access to military weapons and tactics, will we ever choose to take them away?